The Gentry Family cuts the ribbon, officially opening the Gentry Log Cabin! The log house was built in 1870 from native logs cut from the Wildcat Hills. It was built with the siding on the outside and plastered walls on the inside. Originally, it served as a schoolhouse that sat on Pumpkin Creek just to the south of Wright’s Gap. In 1890, it was acquired by Benjamin F. Gentry who needed a home for him and his bride, Cora, who were married on November 30, 1890. The log house was moved to the family’s farm just three miles to the east of Minatare. They were freighted across the North Platte River and reassembled onsite. All four of his children were born in the home while the family owned it. In 1968, it was donated and moved to the location of the former North Platte Valley Museum. 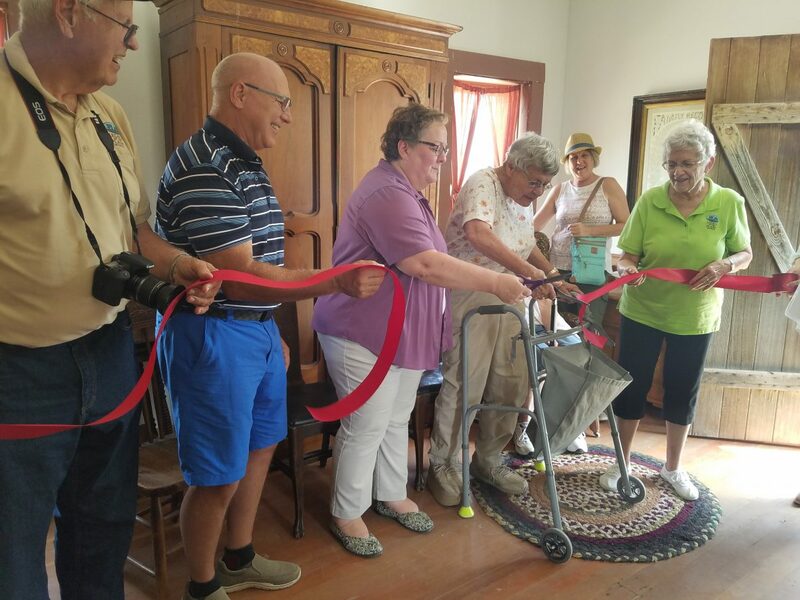 When the North Platte Valley Museum merged with the Farm and Ranch Museum in 2013, it became the property of Legacy of the Plains. It was moved to its present location in May of 2017. The house once again faces the south, just as it originally did in 1890.